The MIL-Trans SeriesTM provides AC Voltage conversion from 50 to 5000VA. These systems have internal surge suppression and wide temperature ranges. 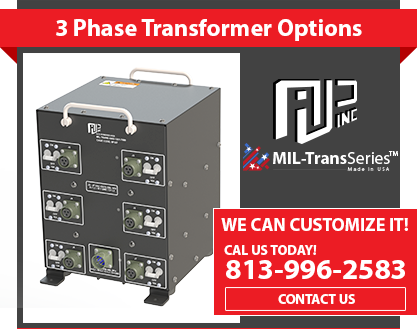 AJ’s Power Source Inc. is pleased to announce the release of our new Military Power Transformer Systems. MIL-Trans SeriesTM is a Ruggedized COTS Military Compliant Transformer System Built for deployment and operations equipment. This unit is available to all the Military Industry, homeland security and government contractors. Light weight auto transformer built for reliability, this fully Ruggedized system is ready for world wide deployment. The MIL-Trans SeriesTM provides AC Voltage conversion from 50 to 5000VA. These systems have internal surge suppression and wide temperature ranges. This unit is built with 120 thousandths aluminum walls and mounts. The system has a high end, built in breaker that is externally resettable. Rugged Tactical Power Transformer Built for Harsh Environments Ready for World Wide Deployment. Our Rugged Tactical Power Transformer has been designed for Ruggedized for Field Use, -40 to 70C operation, light weight auto transformer, environmentally sealed, external resettable breaker, solid and stackable, up to 5000VA and custom configurations are available. 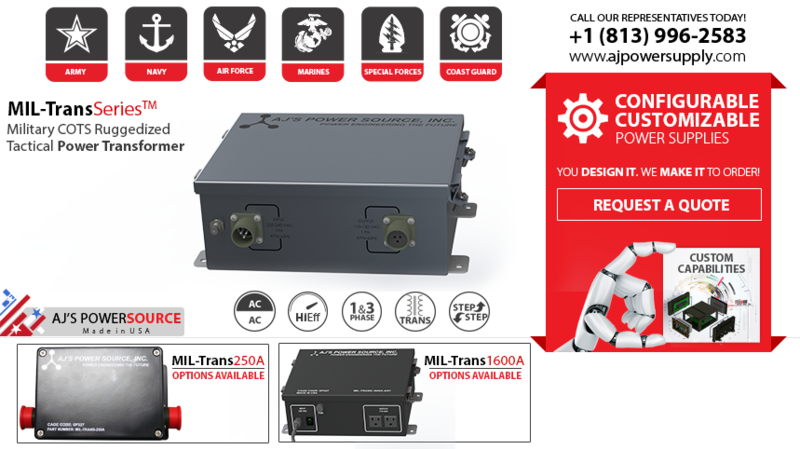 AJPS’s has been supplying high end Military Transformers Power solutions to the Navy, Air Force, Army, Marines, Special Forces and Coast Guard for over 20 years. All of AJPS’s operations are monitored and controlled by an ISO 9001:2000 based quality systems. To learn more about our custom capabilities please, Contact us online or call our main office at (813) 996-2583 our experienced Representatives will provide you a custom Quote for your custom power requirements. Check this box if you are interested in receiving emails about our products. Welcome to the AJ’s Power Source Inc. Download Center. Find the latest downloads and documentation for our Product Catalog, including: Mechanical Drawings, Cut Sheet, Data Sheet and 3D Renderings. Fill this form with your contact information, the product you are interested in and the required file. Submit your information, and one of our experienced representatives will email you the required files as soon as possible. If you have more questions concerning our Product Catalog or Data Center, please call our office today! We will be glad to help you.